It’s no secret that I have a weakness for madeleines, and it’s not just because these little French cakes are delicious or that I’m a self-confessed Francophile. In truth, madeleines remind me of home. When I was growing up, we moved from country to country, but wherever we moved, my mother’s cake tins would clatter along with us. She was an obsessive cook and baker, and madeleines were a specialty. For me, like Proust, the smell or taste of homemade madeleines feels more like home to me than any place ever could. On a recent trip to see my family in South Africa, I smuggled a couple of my mother’s precious madeleine tins back in my suitcase. Now, I have the joy of baking them for my own little girl, and wherever we move, the old tins will come too. I’ve included an adaption of one of my favourite madeleine recipes below. It’s from The Cook’s Atelier book and it never fails to achieve ‘La Bosse’, the iconic madeleine camel hump. As we’recurrently in the throes of citrus season, I used the juice and zest of one blood orange. Make sure you butter and flour your tin well, as there are few things more disheartening than when beautifully baked madeleines get stuck. 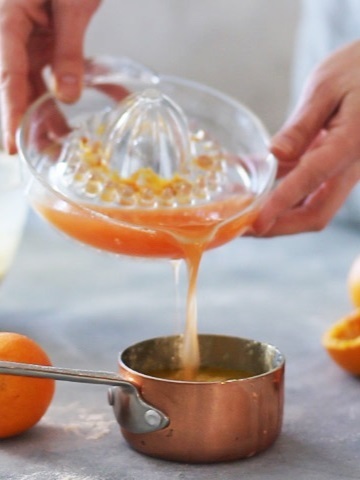 Start by melting the butter, once it's cooled slightly, whisk in the blood orange juice and zest. In a large bowl, whisk the sugar and eggs together until almost doubled in size and very pale. You could do this in a standing mixer to save time. Sift the flour, baking powder and salt into the egg mixture; and gently fold in using a rubber spatula. Pour in the cooled melted butter and gently fold in until just combined. Cover the bowl and chill in the fridge for at least 90 minutes. When you’re ready to bake your madeleines, preheat the oven to 180C. Brush the madeleine tin with melted butter and dust with a little flour, tapping away an excess. Remove the madeleine batter from the fridge and spoon into a piping bag (you don’t have to do this, but I find it much easier). Pipe the batter into the tin and bake in the preheated oven for about 12 minutes. 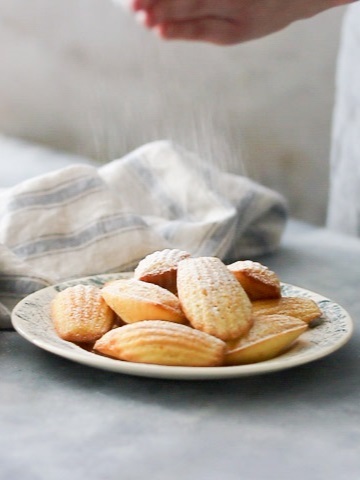 The madeleines should golden and have a signature hump. Remove from the tin, leave to cool on a wire rack and then dust with icing sugar. They are best eaten on the same day.